I’m not a Manga artist. And I usually don’t use color in my art. Mostly because it’s hard, like using brush pens is hard. What I’m trying to say is that my perspective on this particular set of art implements might not be the view of the average person who might find them very useful. 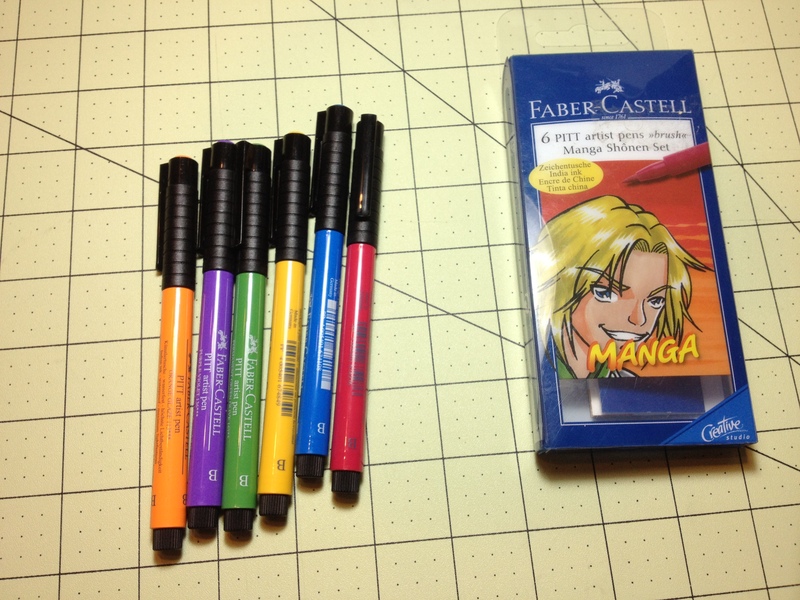 With that said, let’s take a look at this set of Faber-Castell Pitt Artist Pens, the Manga 6 Color Brush set. The pens themselves are fairly plain. There is an indication of the size (“B” for brush, in this case) on the top of the cap. The cap has a set of groves running around it with a shiny finished top and clip. The clip is the same piece of plastic as the cap and does its job in an unspectacular way. The body is straight until the very end, which protrudes as a fluted section for posting, at which it’s effective. The body contains all of the needed information in several languages, which makes it seems a bit too crowded, but I can’t really complain. The section is slightly textured, which is wonderful; it isn’t slippery or uncomfortable. After that is a tapering section for the cap seal and the brush point itself. The cap seals and holds well onto this point. The brushes themselves aren’t of the bristle variety, but are more like a flexible porous point. This makes them much less finicky, and better for a disposable item like this one, as they would wear out faster than a bristle brush. Their flexibility is nice, going from a medium point to one several millimeters wide with relative ease, and they can be bent to some pretty severe angles without any long-term damage being done. The amount of ink they lay down is good. It increases with the pressure on the tip, and makes a full line. At times it skirts on “not enough”, and layering will definitely change the color significantly. Sharp turns with the lighter colors will leave a darker area on the corner. On office paper this amount of ink will bleed though, especially at the ends, but on cardstock there is barely show through. The six colors themselves are a decent selection, but not great: Dark Naples Ochre is a nice, natural looking yellow. Orange glaze is a bit pale and not really a color that is found in many places. Pink Carmine is a bit too dark and is hard to use. Purple Violet, besides having a redundant name, is dark and pleasant, but again not very natural. Phthalo Blue is a great looking lake or ocean blue, but is a bit dark for most uses, and Permanent Green Olive is quite dark and olive, which is more suited to deeply forested areas or jungle than to plains or some more common areas. 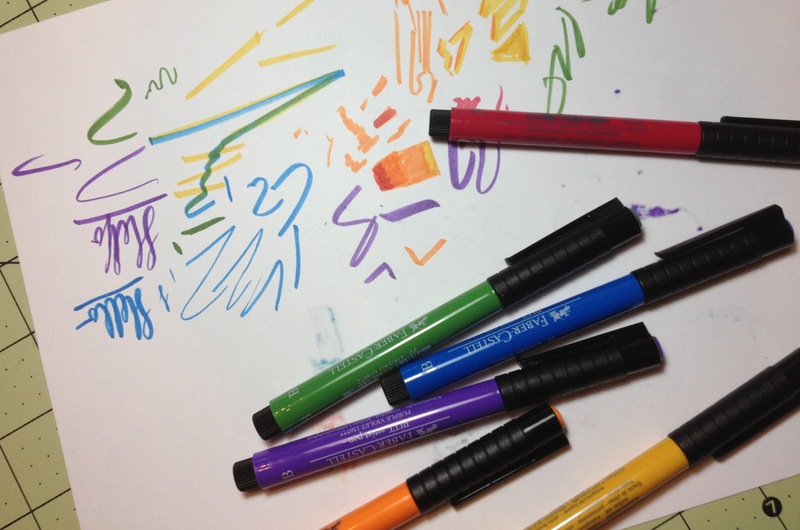 Still, the colors interact with each other very well, and they dry fast, but do mix on the paper, meaning one can get interesting color combinations while still having their pens keep relatively clean. 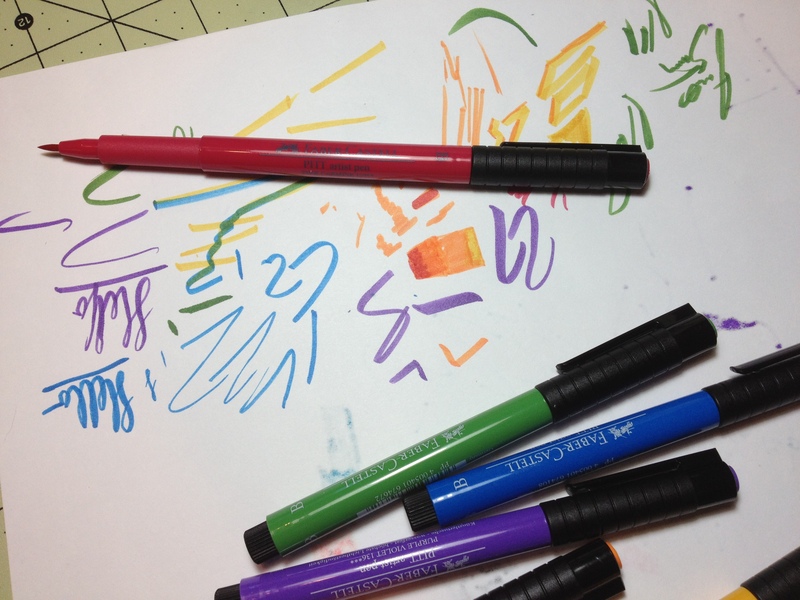 Overall, the set is a good set to introduce oneself to the Pitt artist brush pens. It has a nice simple selection of colors that allows for experimentation and can be used for the base of a larger set. But I certainly wouldn’t consider it a complete set for creating an art work. Many more colors would be needed, and more tailored to one’s specific purpose. For instance, there is very little here to make skin tones with, which would be very important in Manga. They’re very good pens, but the set is incomplete. Addendum: I failed to mention the water/smear proofing of these pens when I first completed this post. Both of which are very good. When interacting with other inks or materials the lines generally stay solid, which is good for resilience but bad for blending. When hit with water the lines don’t move, but they do bleed a tiny bit of pigment. 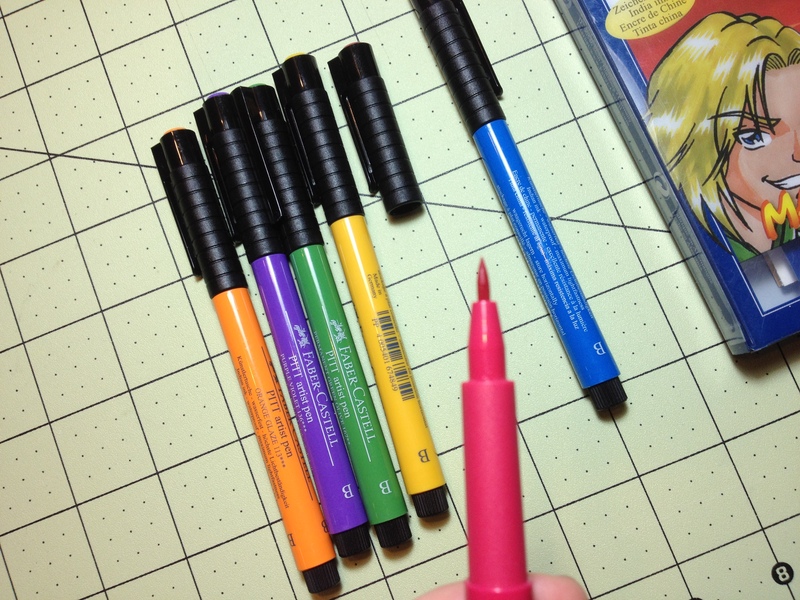 This entry was posted in Consumables, Intermediate Supplies, Utensils and tagged 6 color set, blue, brush pen, brush pen set, color, faber castell, green, india ink, manga pen set, orange, pen, permenant, pitt artist pen, purple, red, review, set, simple, small, yellow by Dragon Co (Austin Smith). Bookmark the permalink.